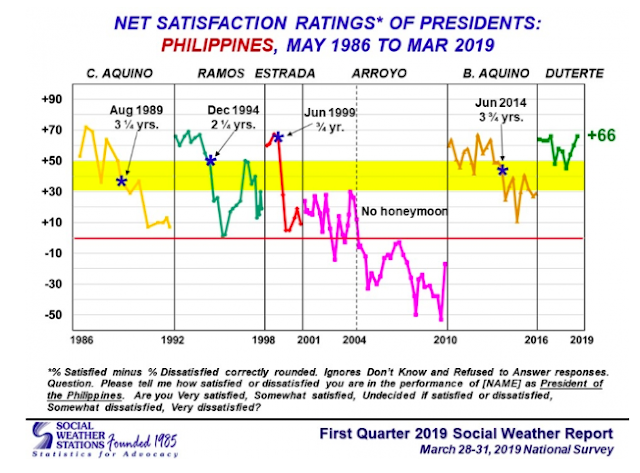 MANILA, Philippines — President Rodrigo Duterte’s net satisfaction rating jumped six points for the first quarter of 2019, the Social Weather Stations (SWS) revealed Wednesday. The latest SWS survey showed that Duterte scored a net satisfaction rating of +66, which is considered “very good,” during the first three months of the year. This was higher than Duterte’s +60 net satisfaction rating in December 2018. The net satisfaction rating ties with Duterte’s personal high set in June 2017. The survey, conducted from March 28 to 31, found that 79 percent of adult Filipinos were satisfied with Duterte’s performance, a five percent increase compared to the December 2018 survey where the president scored a satisfaction rating of 74 percent. 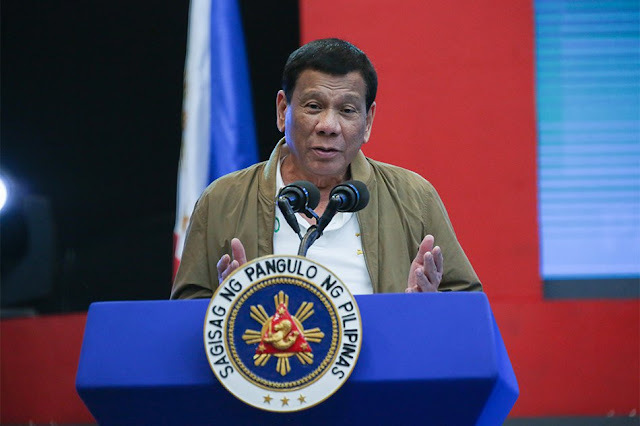 Fewer people were also dissatisfied with Duterte’s performance at 13 percent, a 2 percent decline from 15 percent in December 2018. SWS said the increase in Duterte’s net satisfaction rating was due to a 15-point increase in Mindanao, as well as increases in other parts of the country — Visayas (7 points), Balance Luzon (4 points), and Metro Manila (3 points). Duterte retained his ‘excellent’ performance in Mindanao after recording a new record-high net satisfaction rating of +88, which is one point higher than his previous high of +87 in March 2017. The president, meanwhile, scored a ‘very good’ rating in the Visayas, Metro Manila, and Balance Luzon at +69, +61, and +56, respectively. Duterte’s net satisfaction rating also increased in the rural areas; in classes A, B, C, and D; among men and women; in all age groups; and in all educational levels. “The March 2019 Social Weather Survey was conducted from March 28-31, 2019 using face-to-face interviews of 1,440 adults (18 years old and above) nationwide: 360 each in Balance Luzon, Metro Manila, Visayas, and Mindanao (sampling error margins of ±2.6% for national percentages, and ±5% each for Balance Luzon, Metro Manila, Visayas, and Mindanao),” SWS said.